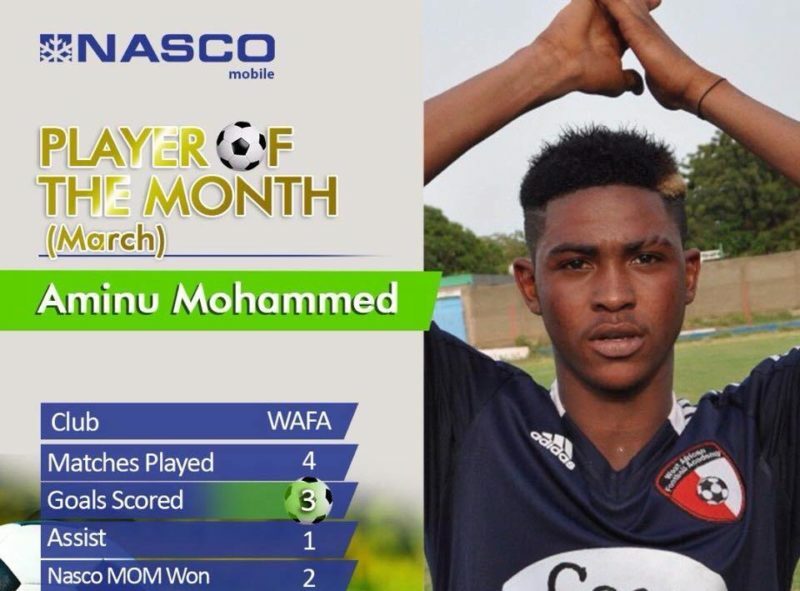 West Africa Football Academy [WAFA] enterprising attacker – Aminu Mohammed has been adjudged by the Premier League Board as the NASCO Player of the Month [March]. The former national U-17 prodigy scored three goals out of four matches he featured for the soccer physicians in March. He also won the Most Valuable Player [MVP] Award on two occasions whiles providing one assist. Aminu won the award ahead of Dreams FC wunderkid [Zuberu Sharani] and Asante Kotoko shot stopper – Felix Annan. For his prize, Aminu Mohammed will receive 32 inch LED television [NASCO], a trophy, and an electronic grooming machine. Coach C.K Akunnor [AshantiGold SC] was also named as the Coach of the Month over Klavs Rasmuseen [WAFA], and Henry Wellington [Hearts of Oak]. The Coach of the Month [C.K Akunnor] will receive a NASCO 40 inch LED television, a trophy and an electronic men’s grooming machine. The NASCO Player and Coach of the Month Award is an initiative by the Premier League Board to help bring the best out of individual players on any match day.